Eleven giant pandas (four males and seven females) were evaluated and ranged in age and weight from nine months to 19 years and 19 to 165 kg, respectively. Effective endoscopy of the gastrointestinal tract requires proper patient preparation. The presence of ingesta and faecal material can inhibit entry into the oesophagus, stomach, duodenum and colon, contribute to damaged tissue or instrumentation and prevent clear visualisation of luminal surfaces. For companion animals (dogs and cats), a minimal 24-hour fast is accompanied by administering an enteric cleansing solution (i.e. Golytely; Braintree Laboratories, Braintree, MA; oral dose, 30 ml kg-1 divided over a 24-hour period) (Willard, 2001; Zoran, 2001). Preparation of the giant panda for upper gastrointestinal endos-copy was limited to fasting due to poor palatability and reluctance to voluntarily accept an oral cleansing solution. Fortunately, the rapid transit time of food through the giant panda gastrointestinal tract (see Chapter 6) enabled adequate preparation with only a 12- to 20-hour fasting interval. Evaluation of the stomach mucosa was improved by preventing access to water during the four to six hours immediately preceding anaesthesia and endoscopy. Without such fasting, partially digested ingesta and watery fluid commonly obstructed visibility of the gastric mucosa and precluded successful entry into the duodenum (Fig. 18.1; Plate XXVII). In companion animals, a plain water enema is used to cleanse the distal colon of faecal material before endoscopy. Treatment usually occurs several hours before procedure onset. Again, due to intractability, each giant panda received an enema after general anaesthesia already had occurred. Administration of 1 to 3 litres of plain water into the colon by gravity flow stimulated the elimination of most residual faeces, certainly sufficiently to permit safely introducing an endoscope to permit good visibility of the colonic mucosa. A plain water enema without additives (e.g. soap) is important to minimise iatrogenic inflammation of the mucosa. Enema administration can cause chilling, inhibiting accurate monitoring of rectal temperature, so water temperature should be similar to the panda's normal body temperature (average 37.2°C; see Chapter 4). Typically, gastrointestinal endoscopy requires patient relaxation and analgesia for 30 to 60 minutes. Without adequate anaesthesia, the procedure can be uncomfortable for the animal while putting expensive equipment at risk of damage (e.g. chewing or gagging with an endoscope in the oral cavity or oesophagus). Adequate anaesthesia is also required because of the need to distend the viscera with insufflated room air. Without insufflation, it is impossible to assess organ distensi-bility accurately (failure of which correlates to pathology; Zoran, 2001) and view the luminal surfaces. For these reasons, inhalant anaesthesia with endotracheal intubation providing airway protection and a surgical plane of anaesthesia are highly recommended. Reduction in saliva production and accumulation also facilitates gastrointestinal endos-copy so using anticholinergics (e.g. atropine or glycopyrrolate) is indicated as part of the pre- or early-anaesthetic regimen. In this study, giant pandas were sedated with ketamine hydrochloride (Ketaset; Fort Dodge Laboratories, Inc., Fort Dodge, IA; 6-9 mg kg-1 i.m.) and then induced by mask inhalation of isoflurane/oxygen until an endotracheal tube could be placed, followed by surgical anaesthesia maintained with isoflurane (see Chapter 15 for more details). Atropine was administered (0.05 mg kg-1 i.m.) during anaesthesia induction. Due to its anti-emetic properties, metoclopramide (Faulding Pharmaceutical Co., Parmus, NJ; 0.2 mg kg-1 i.v.) was administered just prior to initiation of upper gastrointestinal endoscopy in all animals. Subjectively, the use of this drug appeared to facilitate endoscope passage through the pyloric antrum (in contrast to what has been reported in the veterinary literature for small mammals) (Zoran, 2001). For gastrointestinal endoscopy, each panda was placed in left lateral recumbency, which facilitated traversing the angulus and entering the duodenum by positioning the antrum and pylorus above the gastric contents. GA), suction (Gomco 3020; Karl Storz Veterinary Endoscopy) and a 35.6-cm monitor (Sony 14 Inch Monitor; Karl Storz Veterinary Endoscopy). 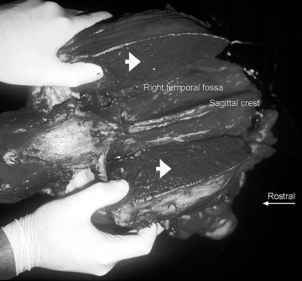 It was determined that the 168-cm endoscope was too short to visualise more than the most proximal duodenum in the largest male giant pandas (those weighing in excess of 100 kg). It was possible to obtain multiple biopsies of the stomach, duodenum and colon using standard, short, oval cup forceps (QFC-1296, 2.4 mm by 225 cm Biopsy Forceps; Endoscopy Support Services). Biopsies were taken of representative areas within these organs, as well as in any area with a grossly abnormal appearance. The oesophagus was not biopsied because of the inherent difficulty in obtaining pinch samples of oesophageal tissues and because no gross pathology was observed. Biopsies were transferred into biopsy tissue cassettes (Endoscopy Support Services) and placed in 10% buffered formalin for preservation. To avoid pathogen transmission and ensure sample integrity between animal examinations, it was necessary to clean and sterilise the equipment thoroughly as in the manufacturer's recommendations. Immediately after a procedure was completed, a copious amount of water (100-200 ml) interspersed with air was brought through the suction channel to remove gross debris. 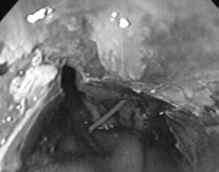 The water button was activated for 15 seconds to clear debris from the air and water port, and the exterior of the scope was wiped thoroughly with 70% alcohol. The scope was disassembled and cleaned with an enzymatic/mild detergent solution following the owner's manual, then rinsed with clean water and disinfected using a glutaraldehyde-based solution. This was followed by a final rinse and drying according to the manufacturer's recommendations.